It may seem that third grade is a bit too early to begin thinking about going to college. But Minneapolis Mayor R.T. Rybak doesn't think so. Auggie Eagle doesn't think so. And neither did the 2,700 Minneapolis third graders who participated in the "I Know I Can" College Awareness Day. On Thursday, Feb. 10, Augsburg elementary education majors joined staff from Augsburg's Office of Admission at Seward Montessori school. With Auggie Eagle also in attendance, they read to 60 students from the book, "I Know I Can," written and illustrated by Wendy R. Rouillard. The book helps students begin thinking about how they can take steps, even in elementary school, to prepare themselves for college. By working on improving their skills and studying hard, the book suggests they can do anything they want when they grow up. Sam Waskosky [pictured center], a junior education major and a Bonner Leader, read to one of the groups. Waskosky has been volunteering at Seward Montessori for several years. After she finished reading, she answered questions about Augsburg including what dorm life is like and whether or not college is "hard." 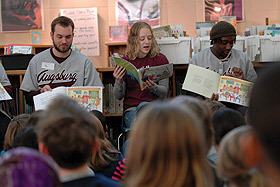 Auggies Devyn Pittorf and Alexis Stadstad also read to different groups. Brenda Hemmingsen, the Augsburg admissions visit coordinator, reminded students that part of getting into college involves getting good grades and having good attendance. She asked students to identify the subjects they would focus on, such as reading, math, and languages. The event, part of The Minneapolis Promise initiative designed to eliminate barriers to post-secondary education for Minneapolis youth, is a partnership of the Augsburg College Sabo Center for Citizenship and Learning, the Office of the Mayor (Minneapolis), RBC Wealth Management, Minneapolis Public Schools, the University of Minnesota, and the Minnesota College Access Network.